Olentangy’s McKenna Riesterer (21) and Orange’s Taylor Foreman (11) battle for possession during the first half of Tuesday’s OCC showdown in Lewis Center. The Olentangy and Olentangy Liberty girls soccer teams can sympathize with each other. 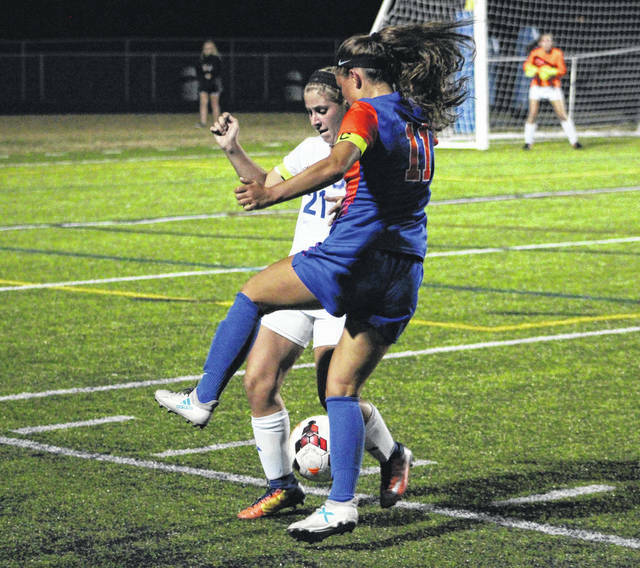 After rival Olentangy Orange scored a pair of goals in the final 10 minutes to knock off Liberty earlier this season, the Pioneers did it again Tuesday night to clinch the OCC-Buckeye crown outright. The Pioneers used a pair of set-piece goals in the final 10 minutes in a come-from-behind 3-2 victory at Olentangy. Hall found Cassidy Ryan on the backside, who touched in the tying goal for Orange (7-5-1, 4-0) with 8:45 remaining. Then, from the other corner, Hall found Grace Poorbaugh in the middle, who pushed passed the go-ahead score with 6:21 left. “I usually look for Cassidy Ryan or Grace Poorbaugh because they’re really good in the air,” Hall said. Both teams struck quickly. Olentangy grabbed the early lead with 37:59 left in the half on a Kayla Primm rebound and put back off a Maddy Loris shot. Natalie Hegg started the scoring chance by perfectly placing a free kick off the cross bar from about the 40-yard line. Orange knotted it up in fairly short order. Delaney Earl, after being fouled in the box, converted the ensuing penalty kick to tie it 1-1 with 30:55 left in the opening frame. Morgan Endsley corralled a pinball off a Hegg corner kick and put it in net to give Olentangy (8-3-3, 1-1-2) a 2-1 lead with 4:53 left in the half. Both teams are out of league next. Orange hosts Thomas Worthington Thursday night at 7:15 p.m. and Olentangy visits Big Walnut Saturday at noon.